In a little less than two weeks, MJD and I are going to be hosting our first holiday by having our families over for Easter Brunch. We are super excited for it and of course, I’ve been planning out some fun ideas for my favorite meal, brunch. As I was thinking about Easter (beyond the actual reason for the holiday, of course), I thought about Easter traditions we had when growing up. Easter baskets filled with goodies was something we looked forward to each Easter morning- you know my sweet tooth loves all that candy! 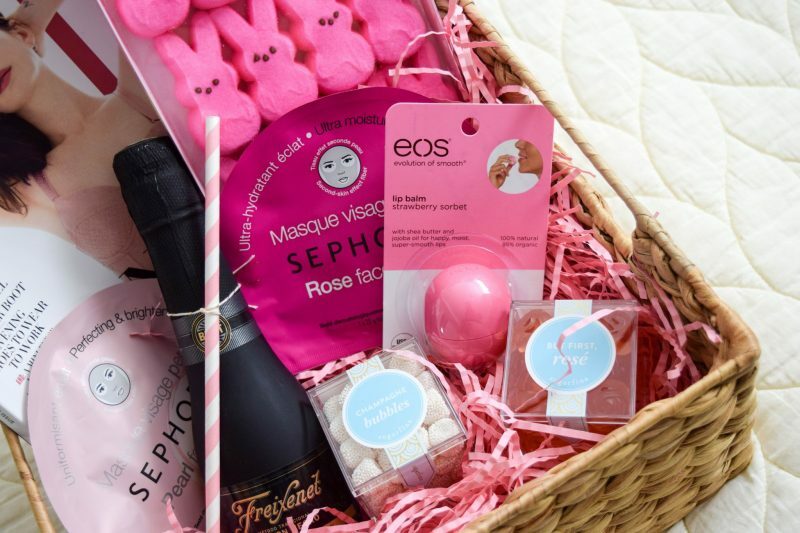 While most people might think an Easter basket is a bit childish, you are reading the blog of a girl who still insists on believing in Santa ( because duh, if you don’t believe you don’t get gifts!). And who says Easter baskets have to just be for kids? I thought it would be fun to take a twist on the traditional Easter basket as a little surprise for our out-of-town guests. Favorite traditional Easter candy- call us gross, but my sister and I LOVE Peeps! While the basket I put together is obviously designed more for a girl given the pink theme, it would be really easy to sub the items for a more masculine basket for the guys! I’m thinking a sports magazine, mini bottle of whisky or bourbon and the super cute bourbon themed Sugarfina candies. 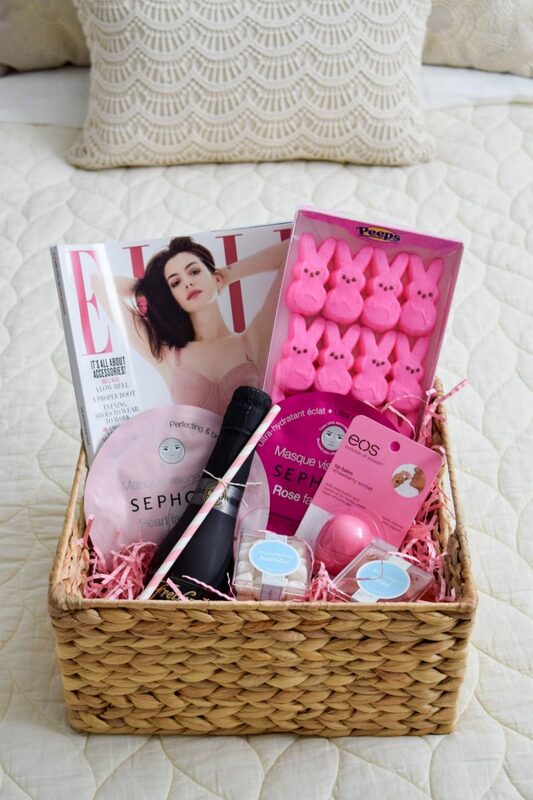 An adult Easter basket is the perfect way to celebrate the kid in each and every one of us! Do you have any fun Easter traditions in your family? I love this idea! There is something so fun about getting all into the holidays, which I do as well (Team Santa Claus over here obviously). Also Peeps are the best and anyone who doesn’t agree is missing out! Such a cute idea! I’ve made a man Easter basket for my boyfriend and filled it with fun socks, candies and put it all in a mini cooler! Tess, a mini cooler is the BEST idea for a man Easter basket. Love that! Thanks Monique! Hope you had a great Easter and Birthday! 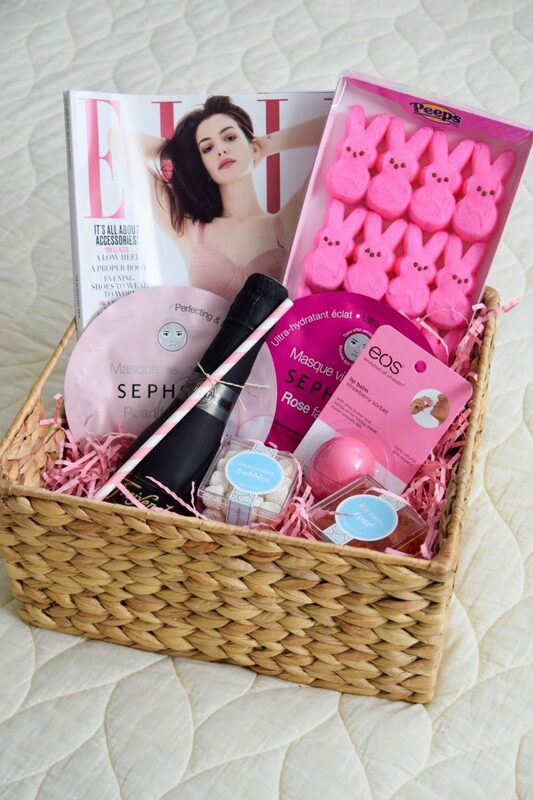 adorable little basket full of goodies! Love this idea! I get a little carried away with the holidays sometimes, and I think I may have to make a couple of these adult Easter baskets for friends this year! Aw yay, glad you like the idea! I tend to get carried away too.. Obviously 😉 Hope you had a great Easter!